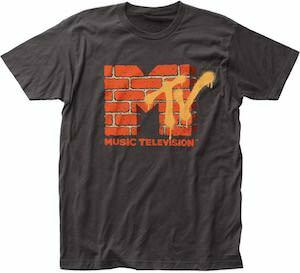 Music and the red, white and blue, you can now show off both with a t-shirt that boasts the MTV log and the American flag. The 3 dimensional M in the MTV logo is colored like an American flag with the red and white stripes with a blue square and white stars. Underneath the logo, Music Television is written in capital letters. This t-shirt comes in black and ranges in men’s sizes from S to 2XL, so all music lovers can find a size to fit them. It is 100% cotton and the distress printing is an amazing touch to create a retro effect. Wave your flag for the MTV American Logo T-Shirt.